The equation of time is the measurement of the difference between actual time and the conventional time used in everyday life. It is a classic complication of Haute Horlogerie, which harks back to the ancient link between time measurement and astronomy. Because of the elliptical orbit of the Earth round the Sun and the particular tilt of the Earth’s axis of the rotation in relation to the equator, a day is exactly 24 hours long only four times in a year, while on all other days there is a difference between real time (solar day) and conventional time, by which a day may be up to about 15 minutes longer or shorter, depending on the time of the year. This information is displayed on the linear indicator on the bottom of the dial. The new released have a couple of updates and features that were not present in the original 2 special editions from 2014. The new in-house movement featuring 329 parts brings in the GMT function for a second time zone as well as an AM/PM indicator on the sub seconds dial to the right of the 9. The next change from the originals is that the month sub dial is to the left of the 3 on the dial versus replacing the 3. The date window is now below the month sub dial as opposed to the right of the sub dial which caused a bit of a problem in the original models. When the month would reach March, it would partially cover the date window making it a bit difficult to read the day. With this new version you won’t have that same issue. 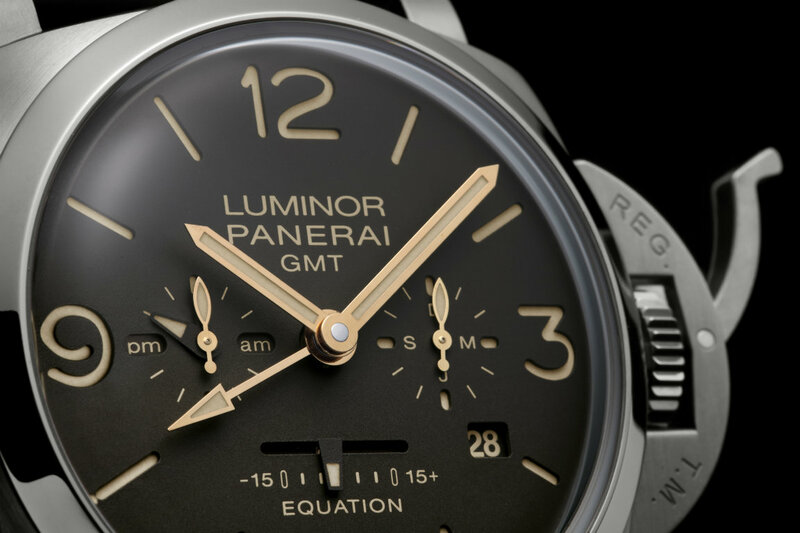 With this slight variation the 3 is now visible giving you the full 3,6,9,12 on the dial. I am very happy to see that they addressed the issue that the PAM516 and PAM601 possessed with the date. They managed to fix it in a clean way even if the date window is not in a spot we are accustom to. The new PAM656 & PAM670 both feature a domed crystal which accentuates the faux vintage lume, gold hands, and sandwich dial perfectly in my opinion. It adds a nice little pop to a very complete timepiece. The two Equation of Time models feature a brushed titanium case with polished bezel creating a nice contrast. Differences between the two models comes in the form of the dial color and strap that the timepiece comes with. 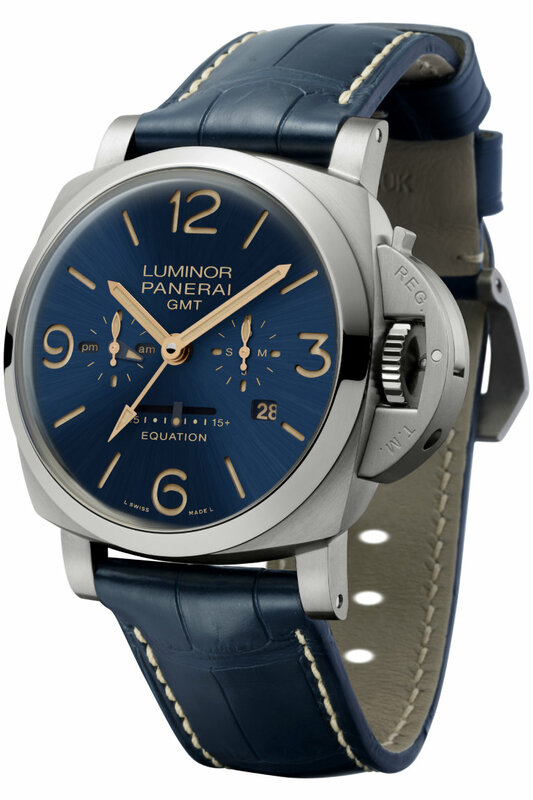 The PAM656 features a brown dial with brown gator strap while the PAM670 features a metallic blue dial with matching blue strap. Both pieces features the sophisticated sun brushed finish on the dial which is created by a special PVD method. 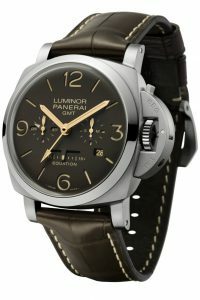 Both watches are presented in the customary Panerai pear wood box. Inside the box is a second rubber strap for diving, quick release strap tool, and screwdriver. 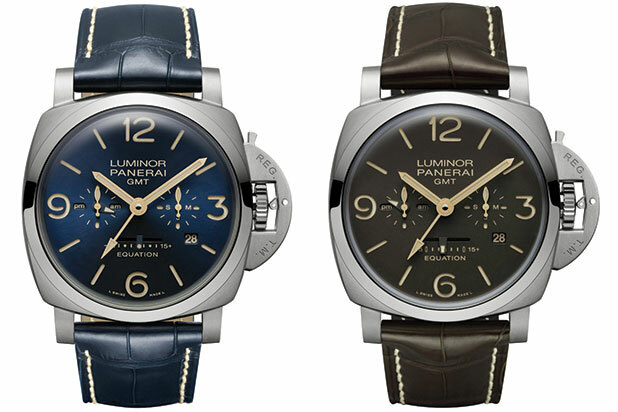 Both the PAM656 and PAM670 will be listed at 21,000 Euro and only 500 of each will be produced. 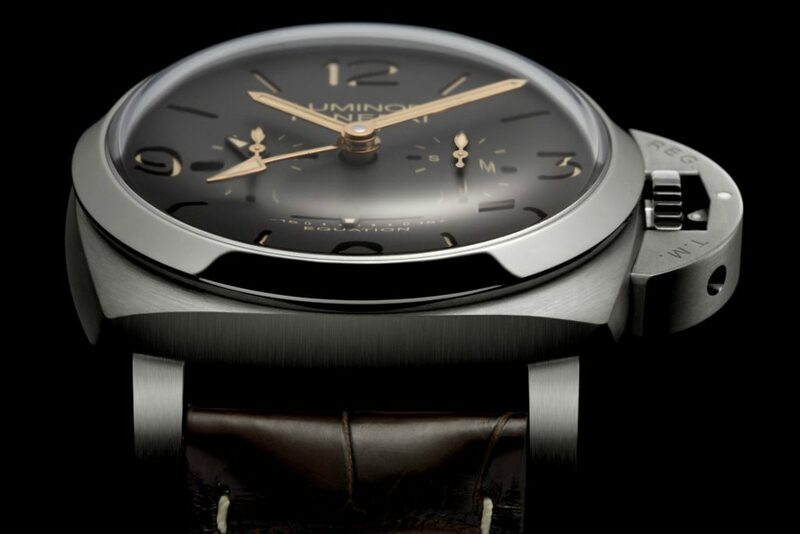 MOVEMENT: Hand-wound mechanical, P.2002/E calibre, executed entirely by Panerai. FUNCTIONS: Hours, minutes, small seconds, date, month indicator, second time zone, 24h indicator, equation of time, power reserve indicator on the back. CASE: 47 mm, brushed titanium. 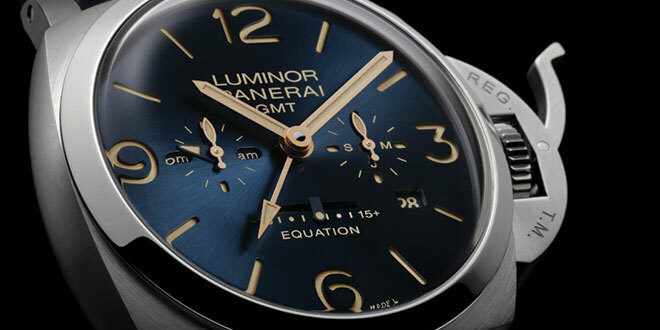 DIAL: Brown with luminous Arabic numerals and hour markers. Date and month indicator at 3 o’clock, seconds at 9 o’clock, equation of time indicator at 6 o’clock. POWER RESERVE: 192H. WATER RESISTANCE: 10 bar (~ 100 metres). MOVEMENT: Hand-wound mechanical, P.2002/E calibre, executed entirely by Panerai. FUNCTIONS: Hours, minutes,small seconds, date, month indicator,second time zone, 24h indicator, equation of time, power reserve indicator on theback. CASE: 47 mm, brushed titanium. 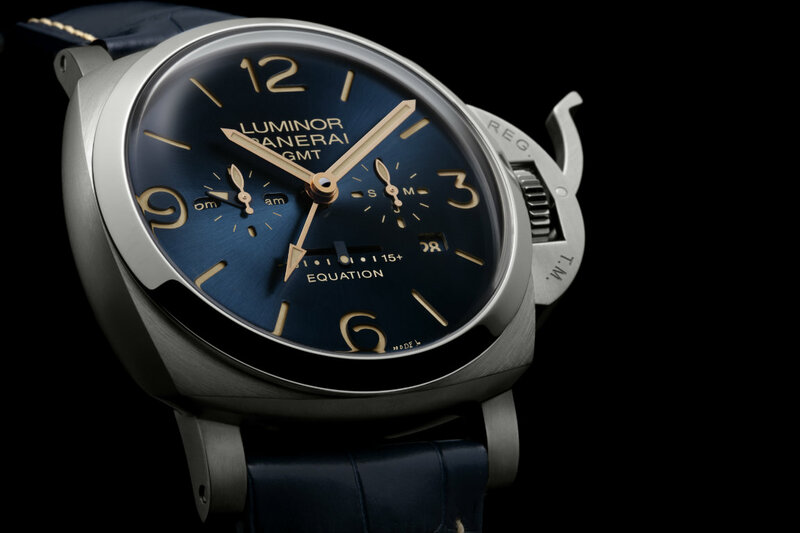 DIAL: Blue with luminous Arabic numerals and hour markers. Date and month indicator at 3 o’clock, seconds at 9 o’clock, equation of time indicator at 6 o’clock. POWER RESERVE: 192H. WATER RESISTANCE: 10 bar (~ 100 metres). Very informative! Didn’t realize the short comings of the originals…!